Fiorentina have registered their new Egyptian winger Mohamed Salah in the club's European squad after he was unveiled with the no.74 shirt. The Pharaohs star completed a six-month loan move to Fiorentina from Premier League giants Chelsea just a few minutes before the end of the transfer window on Monday. The Viola have an option to extend the loan to June 2016 for €1m. Fiorentina are currently competing in the UEFA Europa League. Their first game will be against Tottenham Hotspur in London in the first leg of round 32 on 19 February. Salah appeared twice in the UEFA Champions league with Chelsea this season. 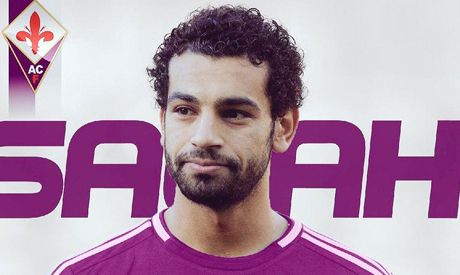 According to Fiorentina's website, Salah will be wearing the shirt no.74. This number is thought to be a reference to the honoring of Ahly 74 fans who died in clashes with Masry supporters in Egypt's worst-ever football stadium disaster in Port Said, in February 2012. Egypt and Ahly former star Mohamed Abou-Treika told Salah in a short message via twitter on Wednesday: "74.. Thank you Salah." The 22-year-old forward, Salah, is looking to play regular football after warming the bench at Chelsea for a whole year. The 2013 Switzerland player of the year has largely failed to break into Jose Mourinho's starting line-up as the latter usually relies on Oscar, Willian Eden Hazard and Cesc Fabregars to support a lone striker in Diego Costa. What has made Salah's chances to play regularly with the Blues even slimer is the arrival of Colombia winger Juan Cuadrado from Fiorentina. Last year, Salah featured for Chelsea 18 times in all competitions.